Notes: This is the 2-3 year-old Rye which is about when it gets some nice color and settles down enough to have a lot of flavor and character without taking the varnish off furniture (or the inside of your guts) . While the legal minimum for Rye whiskey is 51% these guys have one of the highest ( if not the highest ) percentage at a whopping 95%! Distilled in Indiana and bottled in Kentucky. Appearance: Deep amber, old copper/bronze in the bottle, northern wheat in the glass. Nice edge line on the glass when you swirl it, smooth layer of whiskey. On swirling, with scattered droplets rather than legs developing. First Impression: Rye spiciness, leather, toffee, allspice, malt, dried dark fruits. Clean spicy finish. Taste: Decent rye malt body, nice texture and mouth feel. There is a spicy sourness with an underlying sweetness that makes for a nice overall rye. Drinks: If you want to make a faithful recreation of bygone cocktails, especially those hailing from Prohibition, this one fits the bill nicely. Rye is, of course, the proper whiskey for a Manhattan. Bourbon was later substituted as rye was on the brink of extinction for a number of years until recently, but rye was the original ingredient. This one is young enough to shine in a Manhattan and mature enough not to overwhelm the drink. If only other 2-3 year-olds were as well behaved as this one. This rye with its spicy but mellow character make it a great ingredient for many rye drinks and a fair amount of bourbon-based drinks as well. Cigars: Works well with a mild Davidoff, Ashton or any other mild but spicy cigar. Bottle: Long clear cylindrical bottle with simple graphics, with details that of each bottle (batch and bottle #’s) and plenty of open space to appreciate the color of the whiskey. Black screw cap closure and easy to soak off labels make it a great bottle to recycle for infusions after you finished it. Final Thoughts: Most people who have tried rye in the past 40 years or so would rather drink broken glass than rye because of their experience of the commonly available products. This has led to a further neglect of this type of whiskey in production, use in cocktails and consumer opinion. However, this rye has the potential to change all that because of its low price and good quality allowing you to mix and experiment without breaking the bank. 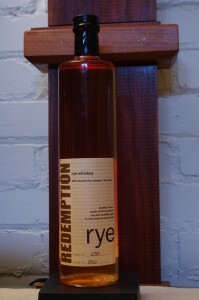 It is also an excellent rye for a bar due to it’s low cost and high quality – you can make a premium cocktail for a lot less money than if you were using some of the more boutique rye (with boutique pricing). Fast loading with some information but pretty basic site.